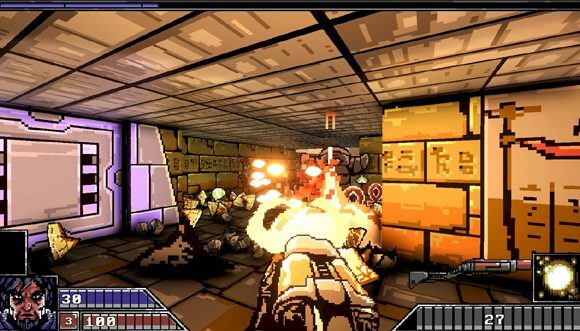 Project Warlock is out on October 18 as a timed exclusive on GOG.com, and it’s an FPS that homages ’90s shooters such as Doom, Duke Nukem 3D and Blood – except with the twist that it’s primarily being made by 19-year-old Jakub Cislo. So he was probably born in 1999, and if we assume Jakub was 8 when he started playing big FPSs, that means he grew up playing Bioshock and Call of Duty 4: Modern Warfare – not Doom, or even Doom 3. Which blows our sadly aging minds, if we could remember what we were talking about. Regardless, Project Warlock seems a deeply interesting shooter. It boasts 60 levels and no procedural level generation, 72 enemies, 38 weapons, 8 spells, and it even has perks. You can check out the YouTube trailer below, with its references to Duke Nukem and Deus Ex, and we can’t deny that it certainly captures the spirit of the early days of the FPS. It reminds us a lot of Ion Maiden, the similarly ’90s-style shooter being made in Duke Nukem 3D’s Build engine, except that’s not being made by a high-school student. It’s also not out next week. It also shouldn’t be overlooked that it’s a timed exclusive to GOG.com. As GOG expands, we presume this sort of thing will be more common, and it’s good to see the service highlighting interesting indie titles such as Project Warlock. Now if you’ll excuse us, we need to have our pills before nap-time.